Although our society conducts a General Meeting with a guest speaker on the first Tuesday of most months, we opt instead for a gala holiday celebration each December. 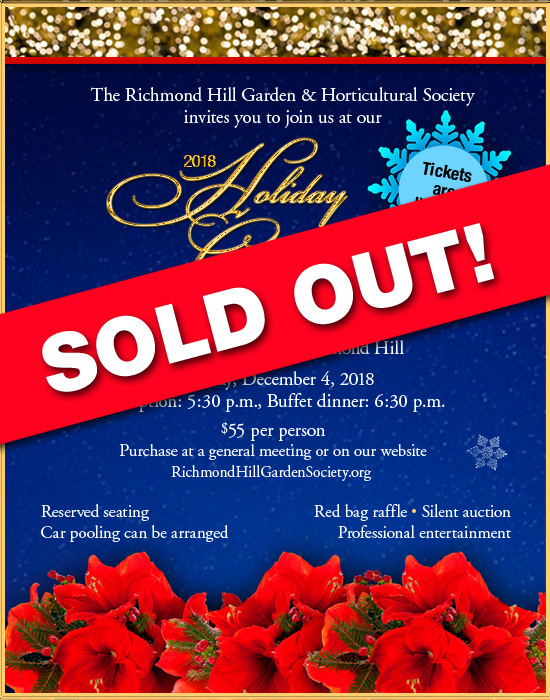 This year's event will be held at the Summit Golf and Country Club at 11901 Yonge Street in Richmond Hill on Tuesday, December 4th. The event begins with a reception at 5:30 pm, followed by a sumptuous buffet dinner at 6:30 pm. The evening includes our popular Red Bag Raffle, as well as a Silent Auction, and Professional Entertainment. Tickets ($55 per person) are SOLD OUT. In case of ticket cancellation, we are maintaining a Waiting List (click here). For a glimpse of what's to come, our Holiday Celebration Committee has prepared a fabulous photo slideshow of our December 2017 event, and hopes our members enjoy the show, which is accompanied by music. Please click here to reminisce about the evening.